The aim of this book is to expose the demonization of working-class people; but it does not set out to demonize the middle class. We are all prisoners of our class, but that does not mean we have to be prisoners of our class prejudices. Similarly, it does not seek to idolize or glorify the working class. What it proposes is to show some of the reality of the working-class majority that has been airbrushed out of existence in favour of the “chav” caricature. 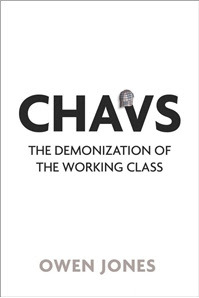 In Chavs: The Demonization of the Working Class, Owen Jones deconstructs the stereotype of the “chav” (if by any chance you’re unfamiliar with the term, a quick visit to the Urban Dictionary will be very eye-opening). Jones begins by stating that class prejudice has become the last socially acceptable form of bigotry, and then goes on to illustrate his point with an anecdote. I’m not sure I’d go as far as saying it’s the last acceptable one, but it does seem to be challenged far less often than some other forms of prejudice. He then goes on to explore the impact of the “chav” stereotype in British politics and society: his focus is specific to this context, but some of his ideas about class and social inequality have wider application and relevancy. I should perhaps start by telling you what Chavs is not: it isn’t, for starters, an in-depth critique of all the problems that come with associating possession of material goods with having any worth as a human being, and of the inevitable costs of having people of limited means get caught up in this ideal. It’s also not a book specifically about how social inequality may cause antisocial behaviour among working class youth. I’ve seen Jones be criticised for not focusing more on these aspects, but I don’t resent him for the book he didn’t write: his approach seems to me a perfectly valid one. Anti-social behaviour is another good example of a working-class concern that could be reclaimed from the right. Although overblown as an issue, it disproportionately affects people in working-class communities and is a genuine blight on some people’s lives. On the one hand, a new class politics has to attack the root causes, like youth unemployment, poverty and a lack of facilities for young people; on the other, it has to defend people from being terrorised in their own communities but without falling into New Labour’s trap of stigmatising working class kids. ‘New Labour’s emphasis on anti-social behaviour and attacks on civil liberties was about encouraging people to attack one another and blame one another for what was going on in their communities, rather than the system itself,’ says John McDonnell. ‘And that doesn’t absolve individual responsibility or anything like that—but it’s trying to get it into context. In every working-class community, you’ve always had rogues, you’ve always had people who behaved badly—and what you try to do is overcome that—but people do that by controlling their own communities. Meritocracy can end up being used to argue that those at the top are there because they deserve to be, while those at the bottom are simply not talented enough and likewise deserve their place. It is used in education to belittle vocational subjects in favour of the academic. All this before examining the criteria for what counts as ‘merit’: for example, does a multi-millionaire advertising consultant deserve to be above a hospital cleaner in the pecking order of things? It is not simply that this growing division renders those at the top more likely to be ignorant of how other people live their lives. As we have seen, demonizing the less well-off also makes it easier to justify an unprecedented and growing level of social inequality. After all, to admit that some people are poorer than others because of the social injustice inherent in our society would require government action. Claiming that people are largely responsible for their circumstances facilitates the opposite conclusion. If you convince yourself that the less fortunate are smelly, thick, racist and rude by nature, then it is only right they should remain at the bottom. Chav-hating justifies the preservation of the pecking order, based on the fiction that it actually is a fair reflection of people’s worth. With this in mind, Jones repeatedly calls for more working class representation in politics, which I think is an excellent point. Class diversity is not the only kind of diversity currently lacking in politics, but it’s important for the very same reasons why further gender or ethnic diversity are important. As you might have gathered by now, I found Chavs a very worthwhile and useful book. It’s even more relevant now than when it was first published a year ago, and Owen Jones actually predicted recent events such as the summer riots in England and the worldwide occupy movements. However, I felt that he often glossed over things or left them out altogether. I wish he hadn’t, because this tendency to sometimes be superficial or to oversimplify things weakens his otherwise very good arguments. Owen Jones regrets the fact that discussions of class have disappeared from the political landscape, and he believes that this is in part a consequence of the fact that nowadays social inequality is only ever perceived and discussed through the prism of race. He points out that current political discourses construct white working class identity as another ethnic identity, which draws attention away from the fact that there are in fact people of every ethnic background in the working class. It also pits the interests of ethnic minorities who also lack economic privilege against those of the white poor, when in fact they share many concerns and should be standing together. At the same time, he argues that working class identity differs from the identities of ethnic minorities because it’s widely perceived and portrayed as an identity whose cultural heritage is not worth taking any pride in. Jones has some very useful things to say about this; however, I’m not completely sure that all these widespread conversations about race and inequity are really taking place. I agree that class needs to be addressed, and that the fact that white people also experience economic disadvantage and disenfranchisement needs to be acknowledged. I also agree that this kind of “divide and conquer” strategy when it comes to class and race needs to be understood and recognised in discussions of white working class racism. I’m just not sure that I see all this attention politicians are supposedly lavishing on race issues at the expense of class ones. I also don’t think that movements to encourage ethnic minorities to take pride in their cultural heritage are anywhere near as widespread and dominant as Jones makes them out to be. We should certainly not be discussing race instead of class, but I felt there was a bit of an “all these race issues are solved now, so enough about them” undertone to his arguments sometimes, and this made me uncomfortable. Appearing alongside Jade Goody was Shilpa Sheety, an Indian Bollywood actress from a wealthy background. Jade took an evident dislike to her, and there was open war between the two. It was a much misunderstood dispute. Shilpa suggested that Jade needed ‘elocution lessons’. When Jade infamously told the Indian actress to ‘go back to the slums’—a phrase wrongly taken to be racist in intent—she was attacking her for being what Jade described as ‘a push, up-herself princess who should see what real life was like. First of all, making racism exclusively about intent is derailing 101. Secondly, telling a wealthy person to “go back to the slums” because they’re a “princess who should see what real life was like” doesn’t even make any sense. It seems quite obvious to me that there were class and race elements to the dispute, and I don’t see what denying the latter really achieves. “Go back to the slums” (implicit: “where you came from”) clearly alludes to racist stereotypes about India, and the way Jones dismisses this is a perfect example of what bothered me about Chavs. He’s supposedly arguing against either/or approaches to race and class, only to fall into them himself (if in the opposite direction) again and again. Discussions of racism among the working class should certainly not essentialise the problem, nor should they draw attention away from equally necessary discussions of racism among the privileged. But to construct any critique of working class racism as motivated by classism is very unhelpful. To give you another example, at one point Jones uses self-report data to support his argument that racism, unlike classism, is in quick decline: apparently only 3% of people admitted to being “very racially prejudiced” on a recent survey. As anyone who has taken an introductory research methodology class will know, self-report data should be taken with a grain of salt even at the best of times. Using self-report data as a reliable indicator when it comes to a sensitive topic such as racism is therefore worse than useless; it’s misleading: all it tells us is that a very small number of people think of themselves as very racist. Surprise, surprise. Unfortunately, sloppy errors such as this one weaken his arguments. I absolutely agree with everything he’s saying here, but I was honestly puzzled that Jones repeatedly uses the phrase “single parents” in a way that disguises the fact that this is a deeply gendered problem. I don’t mean to imply that single fathers don’t also struggle, but first of all, 92% of single parents are in fact single mothers. Secondly, the gender pay gap aggravates the problem in the case of women. Finally, the social censure angle Jones rightly highlights is profoundly gendered: a man would never be stigmatised for “abandoning” his children to work outside the home in quite the same way a woman is. Single parents of both genders don’t have it easy, but why would anyone not recognise that gender affects this issue? How is this helpful in any way? @blinkingmouse: I am really sick of hearing about how the middle classes are destroying our society, with no accompanying critique of the upper classes. @blinkingmouse: with the upper classes. 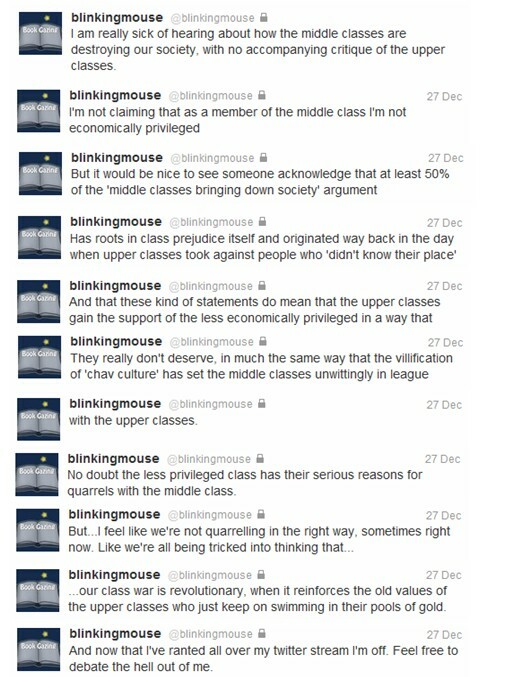 @blinkingmouse: No doubt the less privileged class has their serious reasons for quarrels with the middle class. @blinkingmouse: ...our class war is revolutionary, when it reinforces the old values of the upper classes who just keep on swimming in their pools of gold. To be fair on Jones, he does call attention to this, but only towards the end of the book and in less detail than I was hoping. So despite his professed goals, I don’t think he always quite managed to refrain from placing a disproportional emphasis on the middle class as culprits, or from idealising the working class by glossing over critiques of white working class racism. Surely these conversations can be had without requiring us to wander into classist terrain. Despite my frustration with all the times Owen Jones could have gone one step further and didn’t, I nevertheless wholeheartedly recommend this book. It’s thoughtful, timely, informative, humane, and full of valid points. I hope it’s read by many and that it starts plenty of discussions. 1 Goody was herself of mixed race, but I don’t believe that this automatically places anyone above ever making racist remarks. Wow, Ana, what a fantastic review! One of those times that exemplifies just how much I can learn even before reading the actual book. I'm so glad you provided that link, because I'd never heard the term "chav" and I don't think I would have realized just how derogatory and full of hate the term could be. It sounds like a really important read, despite the problems you mentioned. And I am glad you spoke about these things, because I fully admit that I sometimes (often) have a tendency to not read as critically as I should. I really hope I can get my hands on this one soon. Once again, thank you Ana! "It also pits the interests of ethnic minorities who also lack economic privilege against those of the white poor, when in fact they share many concerns and should be standing together." I think this is a big part of the reason why there are so many problems regarding race in this country. Instead of working together, the government, and probably even more so the media, give reasons for people to see one another as opponents for the things both of them need. And while there will inevitably be racism anyway, as there is anywhere, it's those with power that exasperate it by pitting people against each other. And I agree with you about movements for ethnic minorities likely not being as many as are shown in the news etc. The media is always going to choose stories that will produce the strongest response, and if that happens to be differing treatment between racial groups, that's what they'll show. While the stories are going to be true, they tend to leave out the many good stories of people working together, because it's not sensationalist enough. The quotation from Weir is spot on. And to this "a man would never be stigmatised for “abandoning” his children to work outside the home in quite the same way a woman is." Yes, yes, yes. Just came over to check out your reviews after you commented on my review of Eva Rice's novel and was amazed to see this review of Chavs. It's ranked up there amongst the most important and best non-fiction texts I've read recently and it really is brilliant. Call me sheltered, but I had no idea what a Chav was until I read this review. But yes, I now know exactly who this is. Between you and Jill Broderick, I know when I read your reviews, I will learn something. Excellent, excellent review. I also had no idea what a Chav was, and after reading that definition, I have to say that definition was startling. This was an amazing review, and brought to light a lot of things that I had never considered before. It sounds that although the book glossed over things at times that it had an important message to deliver, and did it with a lot of finesse. I am glad to have read your review and to have discovered these issue and the ramifications that they has. As ever a fascinating and insightful review. The problem with the remaining issues of class in the UK is that they are buried so deep in people's psyches that they are hard to get out into the light. My husband is very keen to do more woodwork, furniture-making essentially, but has spent his life in management roles. He is having the hardest time making a transition and I am aware that class is a part of this. Working in high-tech start-ups brings him much more prestige in his own eyes, than working with wood. His mother would not be very happy about him changing jobs this way and although he won't admit to this affecting his reasoning, I have known the both of them for many, many years and can see from the outside that it does. His mother is very class-conscious, coming from that older generation who witnessed the breakdown in the old heirarchies after WW2. The thing is that attitudes about race, class and gender have changed dramatically in the past 50 years. This is good! But it leaves a lot of our population playing catch-up. Research suggests it takes a generation to give lipservice to change and then another before that change actually inhabits people's thinking. You are of the youngest of these generations and what seems normal to you is weird and often offensive in its own way to the generation of mine and my husband's parents. That sounds awful, doesn't it? But I always wonder what our grandchildren will find to accuse us of in years to come - probably something we don't think much about. But none of that should suggest that I think we ought not to keep the discussion going - we should! All the time. Your blog does wonders to help that discussion. I'd never heard the term chav before, either. I'm thinking that it's more of a British term? Not that I can think of an American equivalent. We use white trash in a derogatory way, but it's more the equivalent of a poor, uneducated hick. I think that the British still place more emphasis on class in a historical context, while in the US class equates to money. Not that I'm disputing anything Owens says...I especially agree with his point about less prestige being given to working class/service class jobs, despite how necessary they are. Probably not a book I would choose to read myself, but a great discussion Ana. Some of the points raised are things I have discussed with family, and some friends myself. Thank you for sharing. Interesting! Does he talk about TV shows? I think they do their fair-share of building and supporting the chav. I'm think Ali G, The Royal Family and Little Britain. You write such wonderful, thoughtful posts about nonfiction. This is an excellent post about a book I've been curious about for a while. I would definitely never say that America has less of a class problem than Britain, but it's qualitatively different here and there. And hence fascinating to me.